Is April the new March? Or am I too impatiently, too desperately, seeking spring? I go in search of greenery each week—into woods and wetlands, along meadow paths—and I can say with confidence, and disappointment, that my palette remains largely ochre and brown and overcast blue. Still, there are a few buds, and the Eastern phoebe wagging its tail in the still-bare maple, a hint of green under last year’s grass, and daylight past seven. Hold on and wait, they remind me, just around the corner is renewal. Tips and Techniques: I’ve done a few posts about using a grid and, here again, this format proved adaptable and well suited for a hike at the Gilsland Farm Audubon Center in Falmouth, Maine. In advance of the hike, I divided this 2-page spread into 12 equal squares, using light pencil outlines for each box. Once in the field, I combined boxes based on the subjects at hand. It was just warm enough to draw and paint in the field, and I added the lettering and outlined each box when back inside. I like the way these small vignettes add up to covey my overall experience, much more so than had I done a single sketch. This entry was posted in Journal, Maine, Watercolor and tagged sketchbook, spring, travel sketching, using a grid by Jean Mackay / Drawn In. Bookmark the permalink. We can all use a bit of inspiration after the long winter, eh? Being in Maine was a nice boost for me. as always, your works are very fascinating. Here spring is coming and every tree or bush has its buds. much wind, rain and sun. best regards from Italy! How lovely. We are not quite there yet, but in a few weeks I won’t be able to keep up with the unfolding. Enjoy! So inspiring! I love your work! Thanks for being a steadfast fan! Glad to offer some inspiration! Was just over there last week for the first time. Taking my granddaughters back next week for hands on live bat program. Glad to have found it only @40 minutes from home. I wish I could go back in May and June– the birding there is going to be spectacular! I may stop on my way to Hog Island in July. Enjoy it! We’re being clobbered by snow wind and sleet as I type this. Wondering all the while if we’re really in spring. 14” and counting! I have only my feeders to inspire me. Just recently I sketched a small flock of redpolls. What a treat! A little dollop of color to cheer me up. I’ve notice too the gold finches turning yellow again. Yes spring is trying to “spring”. Glad to know I’m not imaging the slooooow transition. Love this depiction. Thank you. Oh, Erica! 14 inches! What an insult for April! Keep your eyes– and your sketchbook– trained on the feeders! This post is wonderful. I use grids all the time and never thought to start with a light pencil full grid of squares. I am always trying to align my sketched rectangle frames. This is a perfect plan – instant design balance. Also, I just shared this post and gave you a shout-out as one of my favorite sketchbook artists in our Sketching & Watercolor Facebook Group. Hope many of the 2000+ member become new followers. Thanks Jessica! This way of doing a grid is very flexible…you can combine in so many ways and it always works. You should head back here to Anacortes. The tulips are blooming! I do have to confess that it’s still mostly in the 50s during the day, but there’s lot of green to see & paint. I do use this grid system that you taught us. You’re the best. I was so happy to find this page through the Sketching & Watercolor Facebook Group. I live in Maine and was always looking for your booth at the Portland Sidewalk Art Festival. I purchased your limited edition of Lupines the year it won the Best of Show in the festival. Since we honeymooned in Rangeley Me in June, it brings back many happy memories. Hi Gloria- Sorry to say that I think you have me confused with someone else, as I have never shown at the Portland Sidewalk Art Festival. I live in NY but visit and teach in Maine each year. Still, I’m glad you found me here and invite you to poke around or follow. Sorry about that Jean. I realized this after I hit post. I’m thinking of Jean McClean, a local Maine artist, and I couldn’t delete the post. However, I’m really glad I found this site and will be a regular visitor. I love the idea of creating grids before I head out to sketch. What size is your sketchbook? I really like the layout. On another topic, have you visited the Coastal Maine Botanical Gardens in Boothbay? It seems this would be just your style and interest. Also, Rangeley, Maine in June is nothing but fields of lupines as far as the eye can see. It is truly an amazing site. Hi Gloria- I have visited the Coastal Maine Botanical Gardens (lovely!) but not Rangeley, which sounds great. I don’t often make it to Maine until July. My sketchbook is Stillman & Birn (Beta) 5.5×8.5, so opens to 11×8.5. It’s easy to carry, and has a good amount of room for most subjects. Enjoy your sketching! I’ve just started a nature journal, thanks for the tips and inspiring page spreads. You are very welcome. 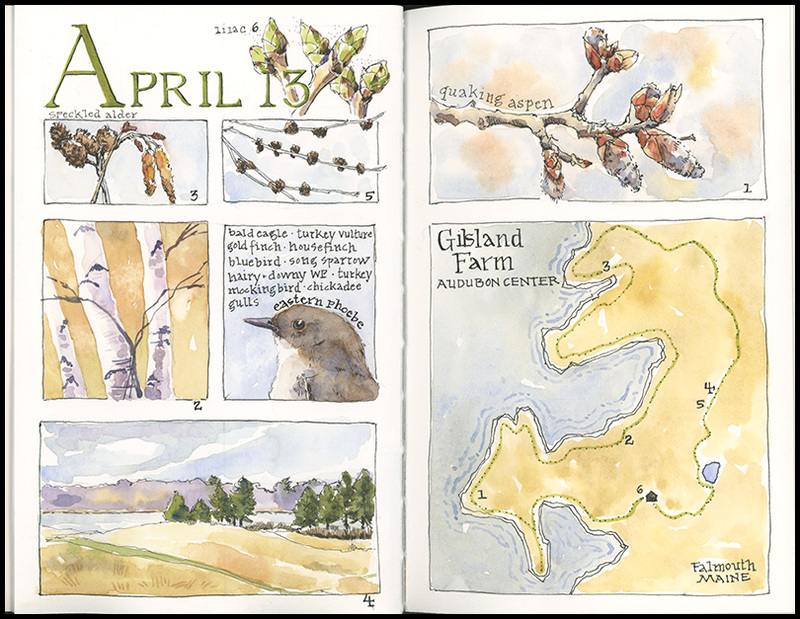 Your artwork/illustrations will lend themselves so well to nature journalling.